I do not quite know where to begin. How about we begin on a positive note? I enjoyed finding out that Max was a girl. I do love when authors deliberately choose to have their characters, of any gender, break asinine, dichotomous gender norms. -- Conversely, he also made her the "mother" of the group. The 14 year old girl with parental issues looking after other children and/or boys? Clearly his choice of a typically masculine name for her didn't mean he would write a character that broke through socialized gender norms in any other way. He threw in unnecessary heteronormative relationship arcs. The chapter layouts were nearly insulting to their targeted audience. As if teenagers don't have attention spans to get them through more than three pages at a time? I understand you don't have to be the 21st century's Bard, but Lemony Snicket, C.S. Lewis, and J.K. Rowling (to name a small few) seemed to do just fine. Not to mention, their demographics were among the same age range, if not younger, than that of Patterson and consisted of infinitely better character development/arcs, plot execution, elocution, and so on. How he managed to squeeze out another 8 novels after this, I will never understand. Honestly, as a woman, I am insulted. This is a book advertised as empowering young women to embrace their strength, when in reality this is just as simplistic, generic, and sexist as pretty much any other book that has ever been written. One might as well lump this guy in with D. H Lawrence, since both of them seem so intent on crafting women for their own pleasures, regardless of how actual women really feel or think. Granted, Patterson wasn't as corporeally libidinous and pornographic in his approach as Lawrence was. This still doesn't change or negate the fact that he wrote a two-dimensional female character from the privileged perspective of a white, hetero, cis male. He used a played out, flat, vapid, formulaic approach to pump out a few books in order for his own monetary gain. This book has little to no substance whatsoever. I wouldn't call it a waste of trees, necessarily. I do not believe in media censorship and I believe every person should read whatever fills them with joy. -- But I think it is immensely important to know what you are getting into when you pick up a book and to know what place the author is coming from when he/she/they wrote their piece. One of the greatest dangers our society regular faces is people's the tendency to treat figures of great understanding and status in certain areas transversely as authorities of the same degree in others. For example, just because someone is an amazing lawyer and has the ability to argue well, does not mean they should be able to dictate which scientific studies should receive the most funding (For more about this particular issue, I'd recommend S.L. Otto's "Fool Me Twice"). I am sure Patterson has, in some ways, earned the awards he has won. I am sure not all of his works are inadequate. -- But I certainly do not believe this 60 year old white man knows very much about the mind of a teenage girl and the problems we readily face growing up. This novel demonstrates this deficiency rather well. This was a really enjoyable book and will appeal to teenage readers who enjoy adventure stories. From the first page it is action packed with a strong female protagonist (although at first I thought Max was a he) and is filled with suspense, drama, genetic engineering and six kids who can fly. 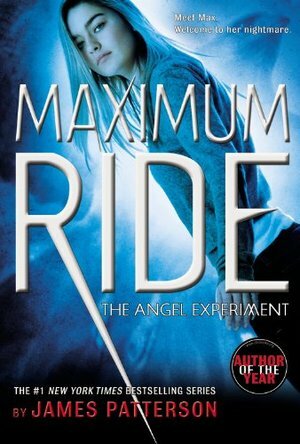 Basically, it is an introduction to the "Maximum Ride" series as many questions are left unanswered, so I'm looking forward to reading the next book to see what happens to Max and her 'family'. I can officially say I have read James Patterson. I cannot, however, claim to be a fan. #angelexperimenta... not worth it.